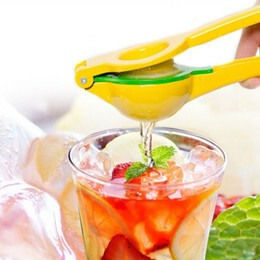 We can’t even believe that it is August already, but it is. Our revisit for this first day of the month is one of our favorites that Mom wrote last year, and we think you will enjoy seeing it again, too. All of the tips can be done with very little money or effort. That sounds good, right? Enjoy the revisit. We Americans are all about the French and their food, their style, and their decorating. I have spent lots of time traveling on a bicycle, in a train, and in a car all over France. Mr. Right and I spent our first New Years as husband and wife in Paris, and we have returned to wonderful France again and again. 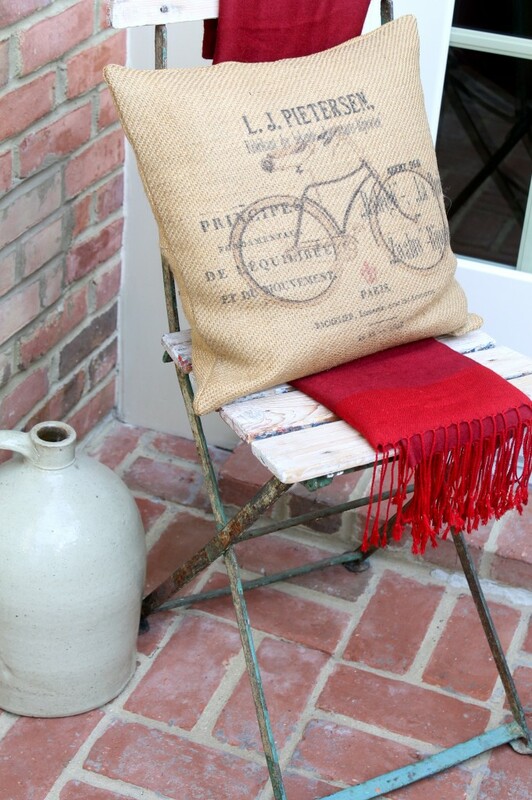 If you are a Francophile like I am, then you probably enjoy having a little bit of France in your own home. You can have French decor without going all out. 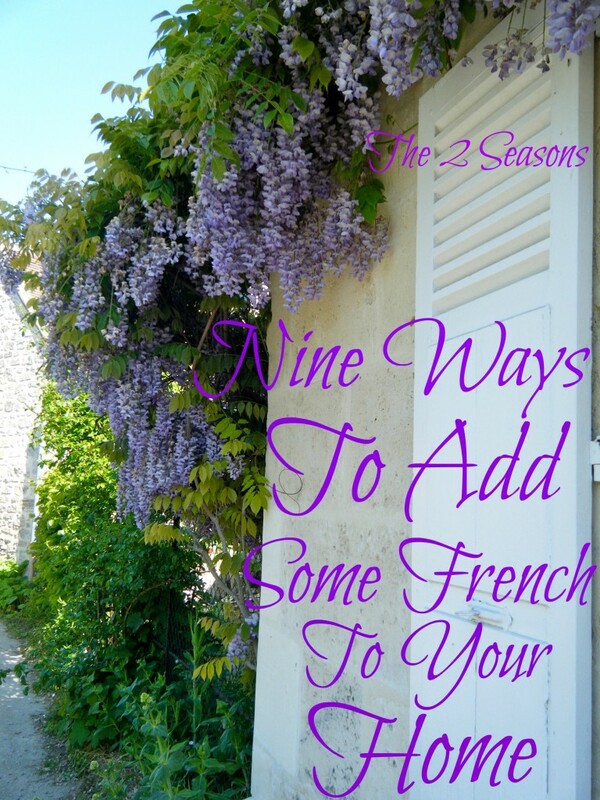 Just a touch here and there might be all you need to give your home a French accent. 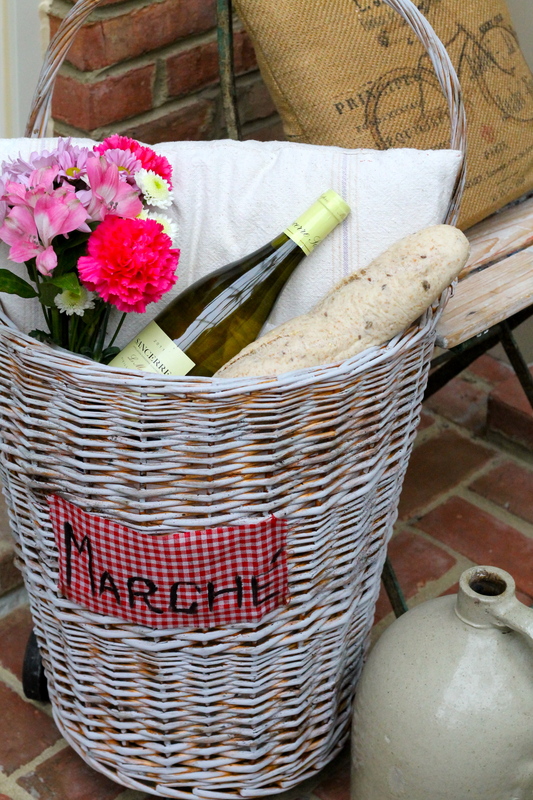 We have nine simple ways to add some French details to your home. It will go from ho-hum to oh la la. 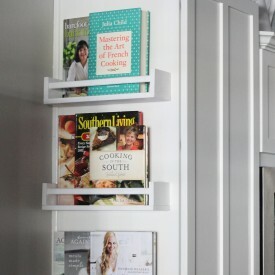 French details are easier to add to your home than you might think. 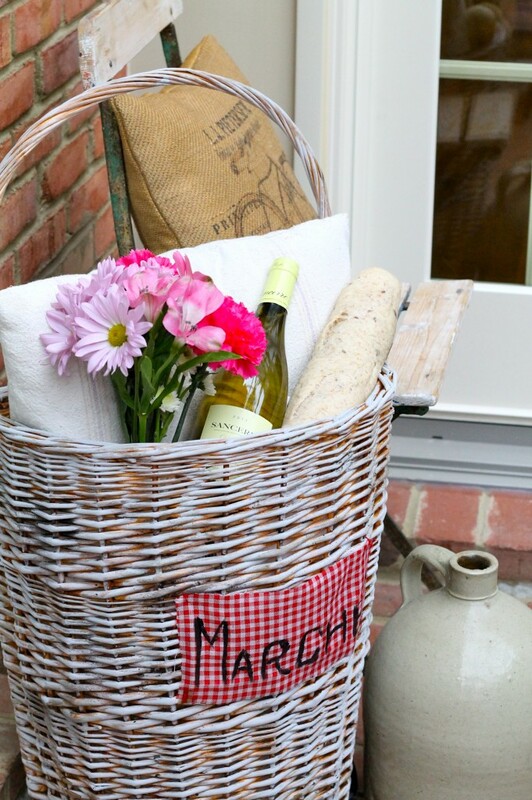 For instance, I bought a French market basket a few years ago at Joann’s for less than $25.00. 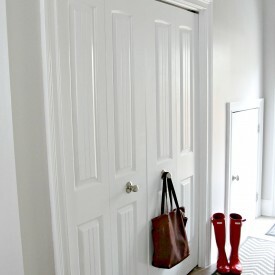 Then I aged it (see how here), and I have it tucked into a corner of our mudroom. It looks as if it’s waiting for me to grab it as I leave the house to go shopping. The scent of lavender is my favorite fragrance in the whole world with rosemary being a close second. 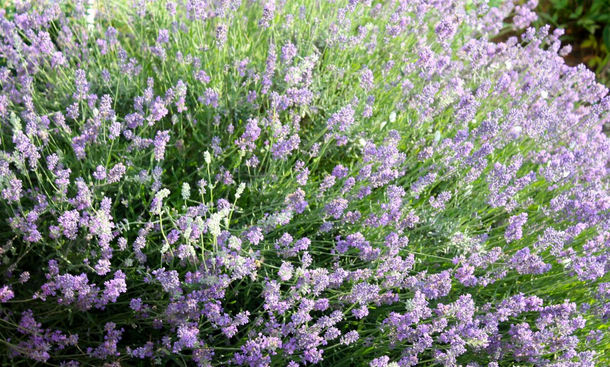 Lavender and Provence go hand in hand, and if you want to add a hint of lavender to your home, it’s easy to do. Burn a lavender candle. I am burning one right now, and I think Yankee candles make a really good lavender scent. Add some bowls of lavender around the house, and enhance their scent by adding a few drops of lavender oil to them. Buy or make some lavender soap (see how here) for your shower time, and make some lavender linen water to spray on your clothes when you are ironing and on your pillow cases right before you go to bed. You’ll sleep much better. 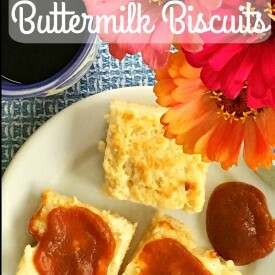 If you want more lavender make these lavender shortbread cookies or this lavender cake. 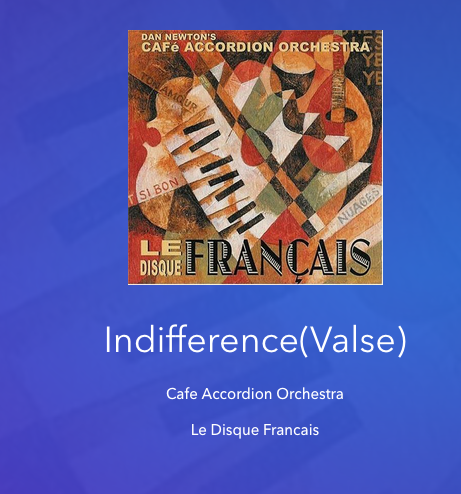 Since I first heard about it last spring, I have been listening to French cooking music on my Pandora station, and it’s free. French music is playing in the background right now on my Alexa Echo Dot. I wish you could hear it. 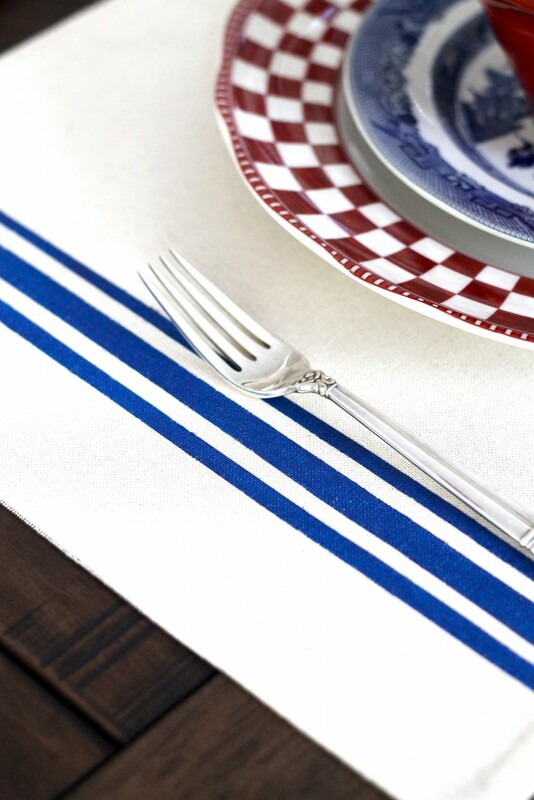 French linens for the table are all the rage, but they can be hard to find and often are pricey. I have a vintage French ticking table runner that I occasionally use on our great room table, but it isn’t something I would want to use during a meal. I made some French-like place mats that give a French vibe to our meals. 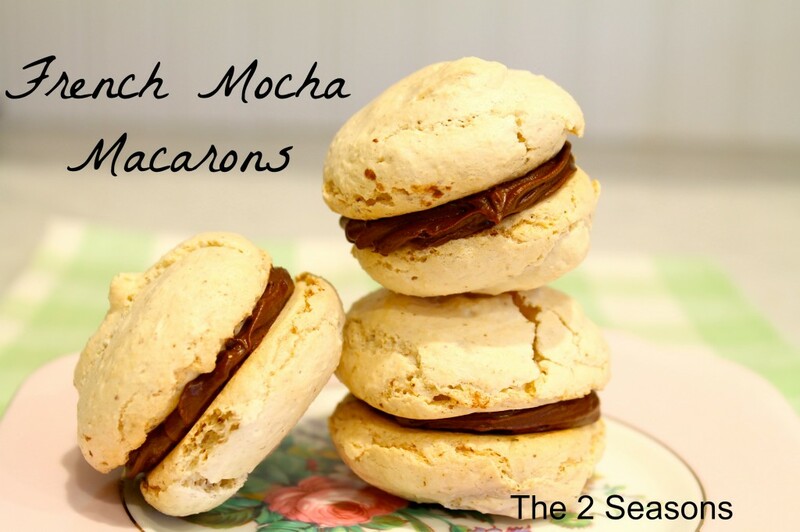 They were easy to make, and you can see how here. I recently bought a table runner and plan to add some ticking stripes to it for fall. As you know, French cooking is more than fries, and it isn’t really as complicated as people might think. 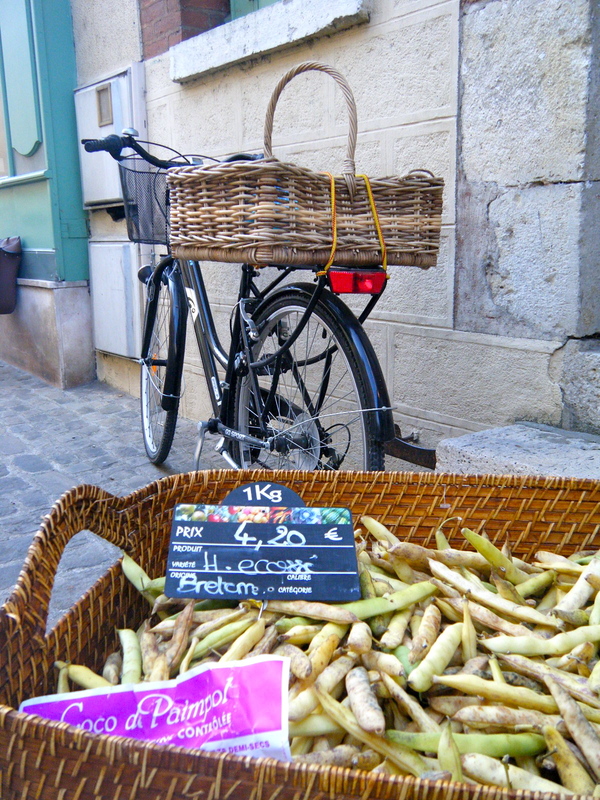 The French use a lot of fresh ingredients in their food prep, and they love their French bread. A simple French onion soup with a baguette on the side is a makes a great meal. Or how about a potato leek soup or my favorite, a croque monsieur? Here’s an easy way to make some butter that tastes very French, and this yogurt recipe tastes exactly like the yogurt I have eaten in France. Two of my favorite French cookbooks are The Little Paris Kitchen and the French Market Cookbook. 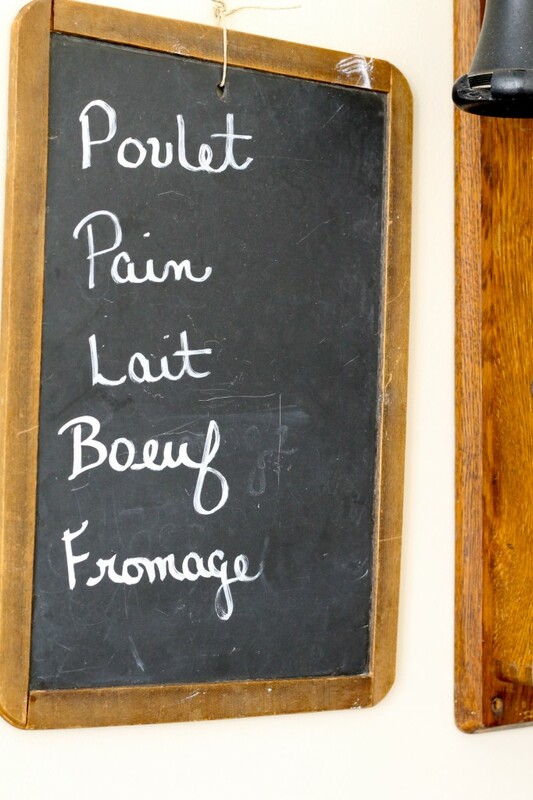 I have a small chalk board hanging in our kitchen that was used by my grandmother when she was in elementary school. I added a few French grocery items to it just for fun. 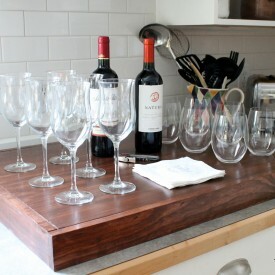 It was a simple way to add a French touch to the kitchen. This would be so easy for you to do with a similar chalkboard that you can buy at a craft store or make yourself. 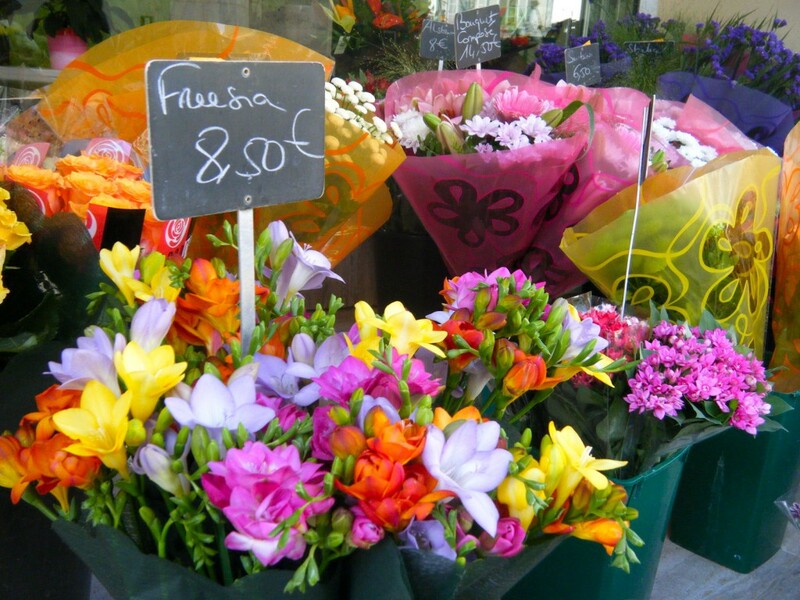 The French love their fresh flowers. A few blossoms in a little vase would work just fine. 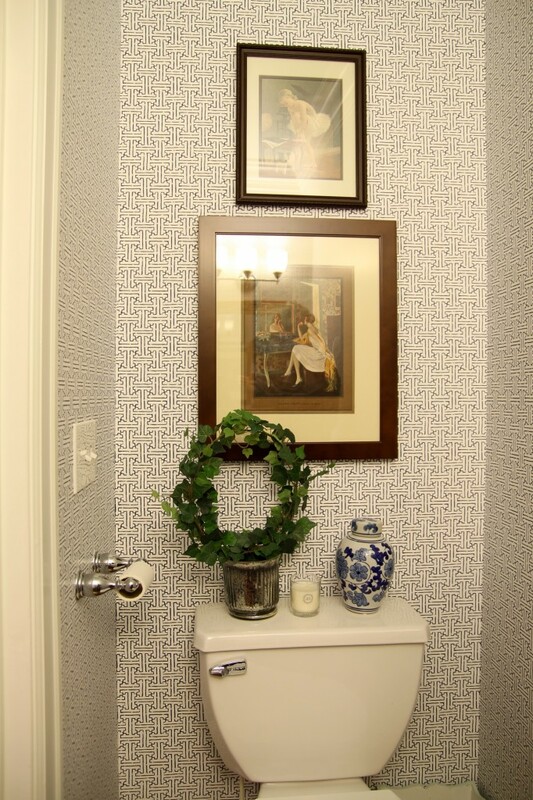 The important thing here is that the flowers, and small bouquets can be scattered throughout your home. This is so much easier than it sounds. Just go to the New York Library’s digital library and type in French. All kinds of printable art, post cards, photos, notes, etc. will come up, and you can download, and print it for free. Just add a mat and a frame, and you have yourself some French art. I have some advertisements from old French magazines hanging in two of our bathrooms, and they are lots of fun. Framing some old French postcards is a cute and easy way to add some French to your home, and French sheet music would work, too. Again, this is easier than it sounds. I have two original wooden park chairs from Paris that I bought from an online antique dealer a few years ago. When they came, they had been painted bright orange, but I removed that horrible paint and ended up with some great patina. One is in our sun room, and one is in the basement guest room. I bought the chairs here. They are certainly not fine pieces of furniture, but I like the whimsy that these chairs add. If you would rather have a more formal look, then go for it with some more upscale furniture pieces. I know we said nine things, but we like to add a bonus now and then. 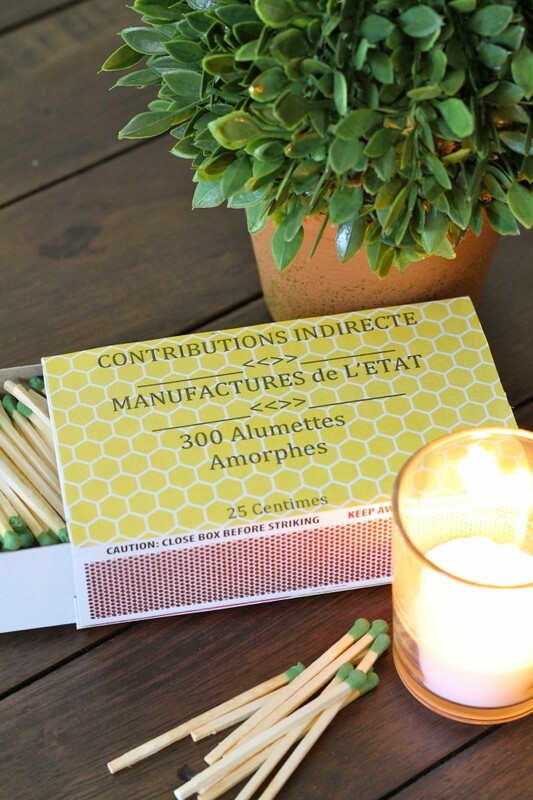 This little match box craft is an easy way to add some French to your home. Just print out the graphic, and glue it to a plain box of kitchen matches. Learn how here. I think you can see from these tips that adding some French touches to any home really isn’t as complicated as it might seem. You can do them all without ever getting on an airplane and flying to France. If you have any other ideas, please share them. We love to hear from you. Please remember to pin the posts that you like to your Pinterest boards and follow us on Instagram to see what we are up to day to day. I would add purchasing some French Antique Linens. I have antique Euro pillow shams, which I love using. French perfume, I always bring back Cote Sud or Annick Gotel, Finally, I add a bottle of Calvados and Piament seasoning, to keep for special occasions or seriously cold weather. I keep a insulated case for brandy in my suitcase and tell the airlines that I have it. Those are all excellent French ideas, Beth.